We love the three ingredient recipes so of course I love the three item DIY for Valentine’s Day! 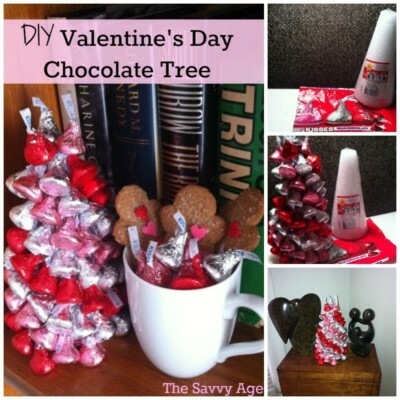 The Valentine’s Day Hershey Kisses Tree is an easy craft perfect for your Valentine’s Day party. 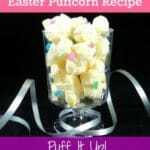 A fun, flashy and festive centerpiece which as a bonus is edible! This is a very simple and straightforward DIY Valentine’s Day food craft once the materials are purchased. The design of the Valentine’s Day Hershey Kisses Tree is up to your imagination and creativity. There is a bit of setup involved, but once the assembly line begins the Valentine’s Day craft will move along quickly. Arrange straight pins for easy access. After deciding upon a design or feel free to have no design in mind and wing it – use the assembly line method of assembling materials prior to placing the kisses on the Styrofoam tree. Take one straight pin and poke the pin through the top of the foil on the Hershey kiss; the top of the kiss has a gathering of foil below the kiss ribbon – that is your target. Begin sticking each kiss into the cone. Stagger the placement of the kisses so the cone does not show through. Kisses in mass are a little heavy and can unbalance the cone until the cone is fully filled; I balance the cone against a solid object while filling the cone with kisses. Once filled the cone will stand alone and is balanced. 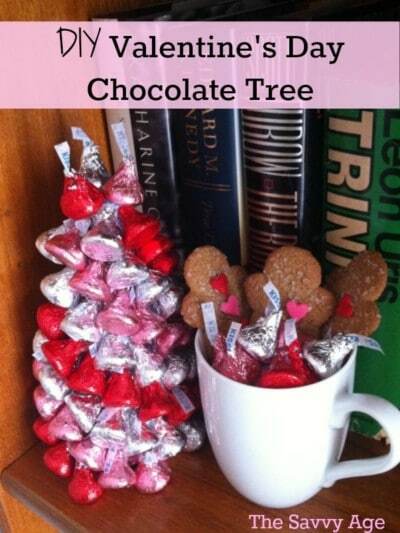 Your edible Valentine’s Day Hershey Kisses Tree is now ready! 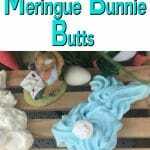 This makes a fun and sparkly centerpiece with the addition of a place mat, candles and themed table settings. This is a fun DIY or crafts for appropriately aged children taking into consideration the safety of straight pins and their age. With kids I let them pick their own design and don’t worry about staggering the kisses so much. It will all come out fine in the end and part of the fun is watching their creativity shine through with the colors and design created. This step is optional, but I wrap aluminum foil around the Styrofoam cone to provide a complementary surface as the color of the kisses complement silver and are shiny. This is totally optional but a nice touch. Start checking your local dollar store for all the materials. One of my favorite dollar stores has a floral section which usually has Styrofoam cones in stock. This is the time to also keep your eye out for pre Valentine’s Day sales on Hershey kisses at the grocery store or drugstore. CVS will usually run a sale or buy two sale weeks before a holiday for holiday themed chocolates. Really cute! Thanks for the tip about checking the dollar store for Styrofoam cones! Love the dollar store!! 🙂 Thanks for visiting! I don’t celebrate Valentine’s Day but this is such a cute idea! That is so COOL! I want one. That is a really cute DIY Valentine’s project. Great idea! I’ve will be sharing on my Sizzling Towards 60 & Beyond Facebook page and have also pinned. 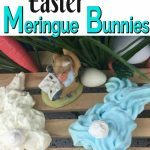 Thanks for linking up and sharing at Over the Moon Link Party. Thank you for visiting and sharing !